Building a new home or deciding to upgrade your current abode means making a decision regarding flooring. This may appear to be a simple decision at first, but once you begin to dig into the vast array of choices on the market, the true scope is revealed. For a durable flooring that can mimic the appearance of most others, luxury vinyl flooring in Fairfax, VA, is the way to go. At Fairfax Flooring America, we have a large inventory of different types and styles, and you are sure to find exactly what you want for your home. That’s one of the great things about vinyl; it comes in so many options you can’t go wrong. It’s a choice which is suitable for use in every room in your home, in one form or another. There are patterns and designs to satisfy even the most discerning homeowner. Not only does luxury vinyl tile come in a dazzling array of options, but it’s also a choice that you are going to be happy with for the long term. It’s very durable and stands up to the wear and tear of daily foot traffic with ease. You can install it with confidence in your kitchen and trust that spills aren’t going to have a major impact and can be quickly cleaned up. If you want the look of wood in your bathroom but are worried that it won’t stand up well to the high humidity and moisture, then select luxury vinyl plank flooring. You get the classic look and style of wood without concerns of warped or buckled damp flooring since vinyl is water resistant. Maybe you are partial toward stone flooring, and that’s not a problem as you can find embossed vinyl which replicates natural stone. It has the same texture and color, but since it’s made from a resilient flooring material, it’s more comfortable underfoot. Not only that, vinyl is an option which is more economical as compared to some of the high-end natural materials which are difficult to source. 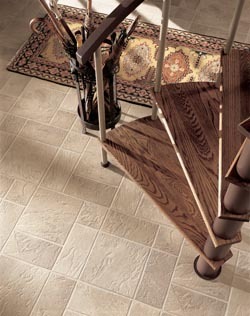 The most effective way to ensure long-term enjoyment from your new floors is to have them installed by a professional. With the support of our team, you won’t have to worry about luxury vinyl tile installation. We make sure all measurements are exact, and cuts are accurate for a precise fit. In addition, we offer our Ultimate Confidence Guarantee for your peace of mind and convenience. Vinyl can be placed over virtually any surface and, in the hands of our skilled installers, it can be laid in unique designs as well. Contact us to learn more about the vinyl floor options we feature in our inventory. We proudly serve customers in Fairfax, Fairfax Station, Falls Church, Centreville, and Gainesville, VA, as well as the surrounding areas.